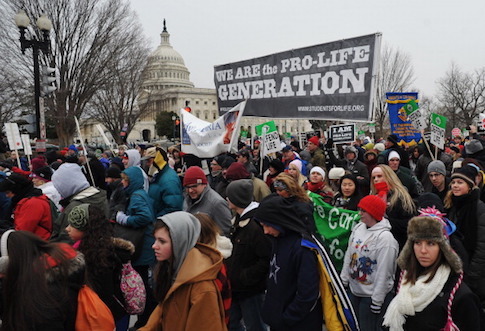 With tens of thousands filling the National Mall Friday to hear President Donald Trump and other leaders address the largest pro-life event in the world, the 45th annual March for Life captured a movement enjoying, but not always comfortable with, its newfound political sway. First held in 1974 on the one-year anniversary of the Supreme Court's nationwide legalization of abortion in Roe v. Wade, the march has grown into a hugely important gathering for the pro-life movement. Data recently released by the Marist Poll found that 41 percent of Americans identify as pro-life, but more support pro-life priorities. The 2018 march included live remarks by Trump, who spoke to the assembled marchers from the White House's Rose Garden. Trump's speech marks the first time a sitting president has addressed the march via video—Presidents Ronald Reagan and George W. Bush phoned in in 1987 and 2008, respectively. "Under my administration, we will always defend the very first right in the Declaration of Independence, and that is the right to life," Trump promised the march's attendants. Trump's remarks come after Vice President Mike Pence's in-person address to the march last year, both of which highlight the White House's continued courting of pro-life voters. Data from the Marist Poll found that 69 percent of pro-lifers consider themselves Trump supporters. Backers of the president have pointed to a series of pro-life victories in the Trump administration's first year. These include the appointment of Neil Gorsuch to the Supreme Court; reinstatement of Mexico City policy, which blocks federal funding for NGOs that recommend abortion; and the opening of a federal investigation of Planned Parenthood for its alleged sale of fetal tissue. March for Life President Jeanne Mancini celebrated Trump's historic appearance. "Since his first day in office, President Trump has remained steadfast on his campaign promises to the pro-life cause and has actively worked to protect the unborn. … We welcome our 45th President, Donald Trump, to the 45th annual March for Life," Mancini said. However, the Trump address also attracted its share of criticism. Writing in America magazine on the day of the march, writer and speaker Haley Stewart, who self-identified as "unapologetically pro-life," called herself "ashamed" of Trump's appearance. Stewart cited not the president's checkered past on the issue, but his policies, which Stewart attacked as not "pro-life" in themselves. "Where do we begin? His inhumane deportation policies? His seeming belief that the value of lives from prosperous countries are worth more than those from poor—or as he allegedly put it, ‘shithole'—countries? His threats to end thousands of lives with nuclear war? … By making Donald Trump a figurehead for this movement, organizers of the March for Life offer not a consistent and beautiful ethic of life, but a farce, a brazen hypocrisy," Stewart wrote. Trump's appearance received qualified praise from march attendees. Russell and Judith, a couple who drove from New Hampshire to attend the march, told the Free Beacon that Trump had their support so long as he actually kept his promises. "We hope the president truly is on a conversion road, and he means what he says," Judith said. "We've had this promise before from President Reagan, and it didn't happen. … So we're just hoping that this president is honest and he follows through with his promises. And we want him to know that we're behind him as far as that's concerned, if it happens." Abby Johnson, founder of And Then There Were None—an organization dedicated on helping abortion clinic workers leave the industry—offered a similarly balanced take, while expressing some practical concerns about the pro-life movement’s ties to Trump and the Republican party. "I'm thrilled that we have an administration that is so supportive of pro-life efforts, and the March for Life, and what we're doing. It's honestly a breath of fresh air, that we actually feel like we’re being supported by the administration," Johnson said. "On the other hand, I do see a need to move away, to separate the pro-life movement from a heavily GOP influence, to really widen that tent to people that want to be considered pro-life," she added. Johnson's questions about the future of the movement are colored by the way in which pro-life Democrats (around 25 percent of the party, according to the Marist poll) face increasing hostility from the organized left. Rep. Dan Lipinski (D., Ill.), who was scheduled to speak at the march, did not appear after fellow Democrats endorsed his pro-choice opponent in his upcoming primary. Related to Johnson's widening tent is the question of how diverse the viewpoints of self-identified pro-lifers can be. One prominent presence at Friday's march, Feminists for Life, touts a title generally associated with the most pro-choice of pro-choicers. Kara, an FFL organizer handing out "women deserve better than abortion" signs, told the Free Beacon that she sees feminist support for pro-life issues growing. "It's definitely catching on," she said. "We have a lot of different groups out there now that have this pro-woman message, pro-life message." Johnson saw the emergence of groups like FFL as evidence of an expanding diversity in the pro-life movement, which she called "a wonderful thing." Asked why, she suggested that a change of message is bringing new people on board. "I think the message is changing. I think, talking about love. … Having a movement that's undergirded in a message of love, I think brings more people to the table," Johnson said. "Instead of us being more baby-focused, we're focused on a broader range of issues. And while that's sort of debatable, whether that's a good thing, for me, I think that one of the beauties of the pro-life movement is that we all have our own individual lane that we're working in. … They can still identify as pro-life, that's the overarching goal, which should be to make abortion unthinkable and really change the culture," she said. Regardless of its ideological unity, one thing was clear on Friday: if there is a future to the pro-life movement, it rests with the energy of young people. The Marist poll found that 36 percent of Millenials identify as pro-life, as compared to 59 percent identifying as pro-choice. But that would be hard to tell from the thousands of high school- and college-aged marchers, holding signs with phrases like "I Am the Pro-Life Generation." "When you look out today, you look at the March for Life, you see this tremendously diverse crowd, and it's tremendously young, and in large part female," said Americans United for Life President Catherine Glenn Foster. This variety of age, as well as the aforementioned variety of viewpoints, means to Foster that pro-life groups like AUL have to foster a variety of alliances in the name of overturning Roe and ending abortion. "We will work with anyone who is pro-life," Foster said. "We work with Republicans, Democrats, independents, Libertarian, Green, whatever. Any group, because if we can agree on the life issue, then we believe in building that coalition." This entry was posted in Issues and tagged Abortion, Donald Trump. Bookmark the permalink.